How Achieve Planner Helps You Get Organized, Increase Your Productivity and Get Things Done! Achieve Planner is an effective productivity tool because it was designed from the ground up with key time management principles in mind. In order to manage your time effectively, you need to write things down instead of using your memory to keep track of them, especially if you are dealing with multiple projects at the same time. Achieve Planner is a practical system that helps you to quickly and easily capture, organize, and manage all your projects and their tasks in one central place. You'll have a to-do list that really works! Achieve Planner uses tree-like outlines, which means you can break-down large items into smaller steps using as many levels as you need. One of the problems with traditional to-do lists is that they tend to lump everything you need to do together into one big long list without any order or structure. As you get more and more things to do, your to-do list becomes bigger and more chaotic, and pretty soon you get lost in all the details. You can’t see the forest for all the trees that are surrounding you. Projects are a good way to collect, group and organize tasks that are all contributing to the same common purpose. 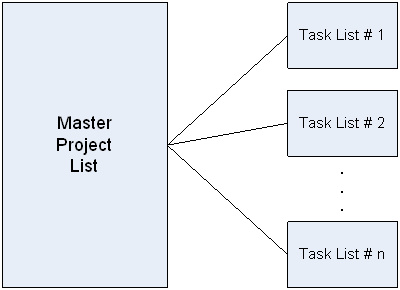 Projects are a logical “container” to organize related tasks. Separating projects from their tasks means that your Master Project List will be smaller, easier to organize and manage, and will give you an overview of all the outcomes you are working on. Focusing on outcomes and not just actions helps you work more effectively throughout the day, increasing your personal productivity and helping you get things done. Your project-specific Task List helps you focus in on just the tasks for one specific project without getting distracted or overwhelmed by everything else that is on your plate. "After trying Achieve Planner for nearly two months I can honestly say that it has revolutionized the way I work. I have an incredibly busy schedule so I need something that can cope with a multitude of tasks, projects and appointments whilst at the same time keeping me focused on what is most important. Achieve Planner does all of this and much more besides. Over the years I've tried pretty much every system on the market and nothing, absolutely nothing, comes anywhere close to this. It looks great, works superbly, comes with excellent instructions, is a pleasure to use, but most important of all - IT REALLY WORKS! For anyone who wants to get organized and take their productivity to the next level Achieve Planner is an absolute must. It's one piece of software that I'm certain I'll be using for many years to come." The tour includes some video tutorials that show you how Achieve Planner works. These tutorials can take a lot of screen space, so you might want to enable full-screen display in Internet Explorer or Firefox by pressing the F11 Key. You can turn it off by pressing F11 again. NOTE: Since Achieve Planner is updated regularly, the tutorials may look slightly different from the version of the software you are using. The main ideas and functionality should still be the same. 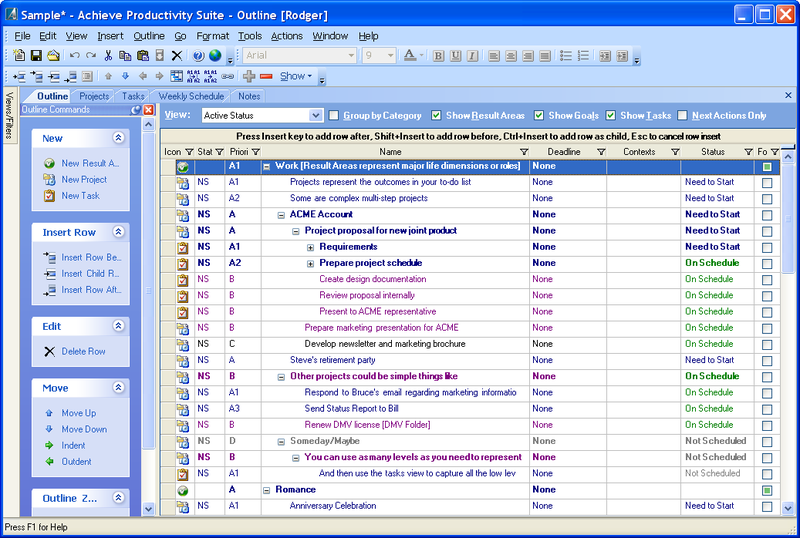 Achieve Planner helps you prioritize your projects & tasks using the ABCD priority system. Priorities are made up of a letter ('A', 'B', 'C' or 'D') with an optional numeric rank. Achieve Planner uses customizable color-codes for each priority level, and you can use ranked ("A1") or unranked ("A") priority values. Using priorities will help you apply the 80/20 rule and spend more time on your most important/valuable projects and tasks. Next, look at all your A items and select the top five to ten most important items and give them a rank. A1 for the most important, A2 for the next most important, and so on. 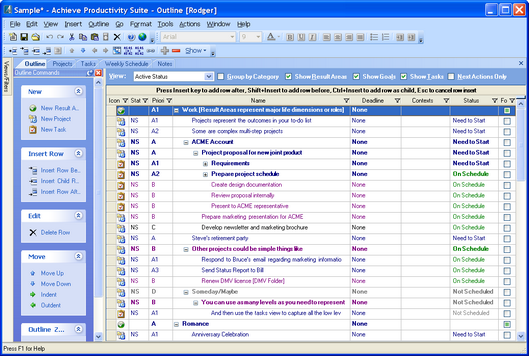 One of the advantages of separating projects and tasks is that you can prioritize them separately. It's much easier and effective to prioritize projects by comparing them to other projects because you are basically deciding which outcome is more important to you right now. It's also easier to prioritize the tasks of a project, where you are deciding what actions are most important for that project. It's much more difficult to prioritize one big, long list of tasks from different projects that are all mixed together. Using priorities will help you focus on what is most important. As CEO of Animal Products, Primal Foods, Bob Fritz is very busy and has to manage dozens of projects. He was frustrated because he couldn't find a solution that could keep up with all his projects and communicate well with Microsoft Outlook. “Before using Achieve Planner, I had lots of loose ends, dropped balls, etc.” Bob says. With Achieve Planner, Bob was able to consolidate different moving parts & projects into a single location for clarity and action. Bob estimates that since he started using Achieve Planner, he saves about 7 hours of productive time each week, which translates into thousands of dollars worth of productivity gains each year. “I was reading over the testimonials on your website and I have to agree with all of them. I have spent the last 10 years working really hard on my time management skills and using the Tony Robbins RPM system.